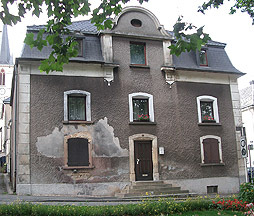 Numerous older houses and historical buildings have been damaged by capillary rising moisture because damp-proof courses are either missing or have become defective over time. Brickwork moisture affects not only the visual appearance of a house. Moisture also has a negative influence on the structure, the room climate and the energy budget. Low moisture penetration levels of brickwork already cause a drastic reduction in heat insulation values because moisture raises heat conductivity and thus impairs the economic situation of the building as a result of higher energy costs. Rising moisture is the transport means for aggressive and structure damaging substances. The moisture lift allows soluble salts to enter into the brickwork through the capillaries and to spread across the entire masonry cross section. These salts – aggressive in combination with moisture – crystallize on the wall surface and thus considerably damage masonry units, plaster and paint. A possibility must be found here to stop the rise of moisture, dehumidify the brickwork and thus secure the structure for the future. An easy to use, long proven method to remove capillary rising brickwork moisture is provided by the AQUAMAT™ method that has received several awards.